CAMBRIDGE - A play about literacy may not sound as if it has dramatic potential, but in the hands of award-winning playwright Melinda Lopez, "How Do You Spell Hope?" is a moving story of struggle and success. Add David Fichter's vivid and imaginative sets, and you have one of the most appealing family shows seen in ages. The Underground Railway Theater's production, which first bowed in 2001, has toured many schools over the years before landing at the company's new home, the Central Square Theater, where it's running through March 1. 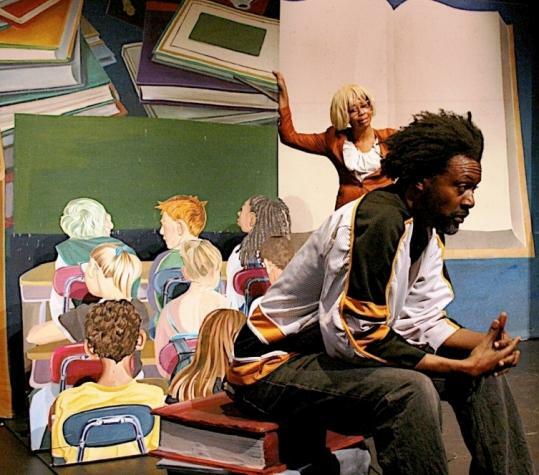 The hourlong show cleverly mixes three stories of people dealing with illiteracy, from the famous (Frederick Douglass) to the unknown, including a Cambridge high school athlete and Marta, a Latina immigrant. Each faces different obstacles to reading, and all of them confront their challenges with assistance from an unexpected corner. Director Debra Wise has two of Boston's top actors, Ramona Alexander and Elliot Norton award winner Vincent E. Siders, in her cast, and both bring an intensity and believability to the characters that keep the audience enthralled even as the actors slip from one character to the next and from one time and place to another. Siders does a terrific job transforming from the thoughtful statesman Douglass to the frustrated but determined Peter Hammill, the contemporary high school hockey star who struggles with dyslexia, and Mr. Washington, the grocery store manager who encourages his employee to learn to read English. For her part, Alexander shifts effortlessly from Sophia Auld, the slave owner who first taught Douglass to read, to Marta, an immigrant who overcomes the language barrier and then becomes a teacher so she can help others, including Peter. Because this is an Underground Railway production, there is also a creative use of puppets - shadow puppets of a bird flying free, a book with the head of a discouraging teacher, and even an oversize book that haunts Peter. Penny Benson handles nearly all the puppetry duties, and it's a tribute to her skill that it's so easy to forget the person manipulating the puppets and see instead another layer to the story. Lopez's story lines intersect gracefully, and "How Do You Spell Hope?" would be effective with little or no scenery, but Fichter's sets add an enormous sense of whimsy to the production. Fichter has taken the company's expertise with puppetry one step further, making the set pieces work like pop-up books. Douglass's time as a slave in the Auld family's home comes to life when "Narrative of the Life of Frederick Douglass, An American Slave," his autobiography, literally opens up to reveal the various rooms in which he lived and worked. Siders manipulates a puppet who represents the young Douglass, built to fit the scale of the three-dimensional book, while Alexander manipulates Thomas, Douglass's "young master." When Siders, as Douglass, turns to the audience and says, "Freedom comes from inside, freedom is knowledge," the power of those words resonates in new ways. Douglass, with the help of Lopez, speaks of confronting any challenge, a strong message for audiences of every age. Directed by: Debra Wise. Set and puppet design, David Fichter. Lights, Taylor Hansen. Music and sound design, Claudio Ragazzi. Presented by Underground Railway Theater.